My life has kind of been consumed by NHL rookies in the first six weeks of the season, so for my first blog entry of 2009-10, I figured that would be a good place to start. At Upper Deck, we try to get the newest rookie cards out the door and on the market as quickly as possible, and with 56 youngsters making their debut since the season began, you can imagine October is a busy month around here for the hockey folks. Here’s a look at some of the newcomers this year — as well as some that debuted before this season, but are still eligible for the Calder Trophy after playing fewer than 25 games in a season. • Michael Del Zotto (D, Rangers) — Let’s start at the top, with the first NHL Rookie of the Month. Del Zotto was a teammate of John Tavares with the Oshawa Generals in the OHL, and along with the top pick of last summer’s draft was traded to the London Knights midseason in 2008-09. He was also a former teammate of 2008 top pick Steven Stamkos with the Markham Waxers Junior ‘A’ team before that. Del Zotto got off to a red-hot start to his NHL career, scoring goals in his second and third games and bagging four goals and eight assists in October. He’s cooled off a little of late, recording only a single assist to go with a minus-4 mark in the Rangers’ past six games. 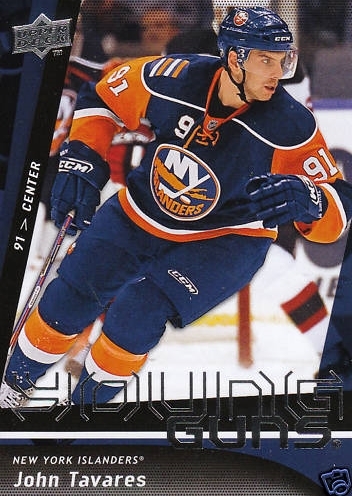 • John Tavares (C, Islanders) — Unlike his predecessor Stamkos, the Mississauga, Ontatio native has looked quite at home in the NHL from the word “Go.” He had a goal and an assist in his debut, and leads all rookies with 14 points (5 goals, 9 assists) through Nov. 11. Tavares also pieced together a four-game point streak (2 goals, 2 assists to go with a plus-4 mark) that helped spark a four-game win streak for the Islanders. • Matt Duchene (C, Avalanche) and Ryan O’Reilly (C, Avalanche) — If a team is going to start a rebuilding project like Colorado has, it definitely helps to hit a couple home runs in the draft like the Avs seemingly did last summer. There were six 2009 draft picks that were in their team’s respective lineups on opening night this season, and two of them were suiting up in Denver. Duchene was the No. 3 pick in June, and came in with more hype, but it has been the second-rounder O’Reilly — the only one of the six not selected in the first round — who has probably been the biggest surprise among this year’s crop of newcomers. He has 14 points (4 goals, 10 assists) and leads all rookies with a plus-14 through 19 games. So much for rebuilding, as the Avalanche stand in second place in the entire NHL, with 27 points through Nov. 11. • Victor Hedman (D, Lightning) — Hedman got his bell rung Nov. 5 at Ottawa, but was set to return to the lineup Thursday night against the Wild after missing the last game. That’s good news for Tampa Bay, because from the moment he first stepped on the ice in his NHL debut, the Lightning have leaned pretty heavily on the 6-foot-6 Swedish blueliner. Hedman played a team-high 26:27 in that game, a 6-3 loss at Atlanta, and only defensive partner and countryman Mattias Ohlund has averaged more ice time for the Lightning so far this season (by 25 seconds). Hedman is averaging 24 minutes a game, leading all rookies by a wide margin. The No. 2 pick from last summer’s draft has held his own in that time, chipping in four assists and netting a plus-1 mark through 14 games. • Tyler Myers (D, Sabres) — Myers won the MVP award for his efforts during the WHL playoffs with the Kelowna Rockets last spring, when he scored five goals and set up 15 more in 22 postseason game for the Western League champs, who then went on to lose the Memorial Cup final to the OHL’s Windsor Spitfires. He attended the Rockets preseason training camp in August just in case, but there was only a small chance he’d be playing anywhere but Buffalo this season. The 6-foot-8 giant is the only other rookie regular aside from Hedman averaging 20 minutes a game or more in 15 contests through Nov. 11. • Jamie Benn (LW, Stars) — Benn was part of the same Kelowna team along with Myers and Flames center Mikael Backlund that had so much postseason success last spring, and he’s made a nice transition to the pro game. Benn, along with several other factors (continued good play from sophomores James Neal and Fabian Brunnstrom; a return to form by goaltender Marty Turco; a return to health by Brenden Morrow and Brad Richards) has Dallas playing good hockey again in early 2009-10. Benn has played a lot of minutes with what would probably be considered the Stars’ top line — with Mike Ribeiro at center and Morrow on the other flank. He has three goals and 11 points through 17 games. • Matt Gilroy (D, Rangers) — Gilroy’s success story is the stuff Hollywood makes movies about. He was a superstar in high school, leading his St. Mary’s High School team in Manhasset, N.Y. to state championships as a captain his junior and senior seasons, but drew zero interest from Division I NCAA programs, and decided to walk on at Boston University. All he did with the Terriers was earn himself three All-America nods, captain BU to a national championship last spring and be named the Hobey Baker Award winner as college hockey’s top player. After that, Gilroy had the attention of NHL teams like he never had when he was “cold calling” college coaches looking for a home. Gilroy has been solid in Gotham, bagging two goals and two assists in 18 games for the Rangers, but more importantly for a rookie defenseman, he is tied with Myers with a plus-6, the best mark among blueliners who have debuted in 2009-10, while averaging 18:55 a night. • Jonas Gustavsson (G, Maple Leafs) — “The Monster” forced himself into the consciousness of NHL general managers and scouts last season by leading the Swedish Elite League with a 1.96 goals-against average and .932 save percentage in the regular season, before helping Farjestads win a playoff championship with mind-blowing 1.03 and .961 marks in the postseason. Much drooling and a bidding war erupted over the summer, and the Leafs won the sweepstakes. As a team Toronto has struggled mightily early in the season, though thanks to Gustavsson’s emergence and a healthy Phil Kessel, they’re showing signs of life). Gustavsson has already effectively wrestled the starting job away from Vesa Toskala, starting eight games to the Finn’s five through Nov. 11. He’s got a 3-3-3 mark and a respectable .910 save percentage in those games. • James van Riemsdyk (LW, Flyers) — The former No. 2 overall pick in 2007 (after Patrick Kane) is tied with Tavares and O’Reilly with 14 points, and leads all newcomers with 11 assists through Nov. 11, despite missing several games after breaking the tip of his left pinky. JVR is now playing with stitches and a bandage on the injured digit, but has played most of his shifts his shifts on what would have to be considered Philly’s top line, with Jeff Carter and Daniel Briere before the injury, so he should continue to see plenty of chances to pile up points. • Jason Demers (D, Sharks) — Demers was not a guy on a lot of people’s rookie radars coming into the season, but he is now after chipping in 10 assists through 19 games, and with Rob Blake out of the lineup, he has been logging the majority of the ice time alongside Dan Boyle with the Sharks’ potent top power-play unit. That’s a good place to be. Demers led all QMJHL defensemen with 55 assists and 64 points playing with the Victoriaville Tigres in 2007-08, so the high assists total isn’t totally out of the blue (though he’d never had more than 19 assists in a season before that), but it was only after that breakout campaign that San Jose drafted a 20-year old Demers in the seventh round, so he would have to be considered a late bloomer. Whatever, he’s playing great now. • Nicklas Bergfors (RW, Devils) — The Devils have waited a long time for this former 23rd overall pick in 2005 to put it all together. 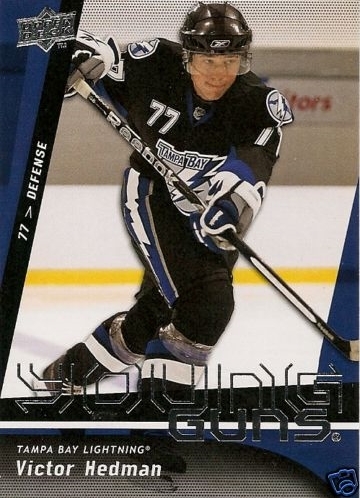 Bergfors had a solid rookie year in the AHL in 2005-06 with the Albany River Rats (17 goals, 23 assists, 40 points), but had sagged to 32 and 27 points in the past two seasons, respectively, and had played just nine NHL games before starting this season in the NHL, with one goal to show for it. He’s finally responding, netting four goals and five assists through 16 games, playing mostly third- and fourth-line minutes. • Nikita Filatov (LW, Blue Jackets) — The Russian winger played in only eight games in 2008-09, and showed flashes of his potential — including bagging a hat trick in a game against the Wild on Jan. 10. But he had only one other point beside that (a goal), and has averaged only a little more than 8 minutes a game through 12 games in ’09-10. The sixth overall pick in the 2008 draft probably won’t be winning the Calder Trophy this season, but I think there’s still a good chance he’ll get a shot to prove himself at some point this year, and he’ll deliver. So far, he’s getting support from his teammates and saying all the right things through some sparse playing time, and is keeping up a good attitude. • Davis Drewiske (D, Kings) — It says a lot about how well Drewiske has played in the early part of 2009-10 that the Kings gave him a three-year, $600,000 contract extension last month. That may not be huge money, but keep in mind the Kings farm system is stocked deep with high draft picks at the defense position — Thomas Hickey, Colten Teubert and Viacheslav Voinov all rank among L.A.’s top six prospects according to Hockey’s Future. Drewiske played four seasons at the University of Wisconsin, helping the Badgers win a national championship as a sophomore in 2005-06, and captaining the team as a senior. He leads all rookie defensemen with a plus-9 through 19 games, and also with 30 blocked shots. • Semyon Varlamov (G, Capitals) — Varlamov was probably the most known NHL commodity among these rookies coming into the new season, courtesy of his solid play in helping Washington reach the Eastern Conference semifinals last spring. But he has found himself on the skinny end of a time share with hot-and-cold veteran Jose Theodore so far this season, posting a lukewarm 2.90 GAA and .905 save percentage in his eight games played, despite recording a 6-1-0 record in those opportunities. I think Varlamov will end up as the Caps’ starter eventually when he heats up following a predictable Theodore slump. It may have already happened: the Russian netminder sparked a big comeback win over the Islanders on Tuesday night in Washington, stopping 25 of 26 shots in relief after Theodore yielded three goals on New York’s first five shots of the game, before stoning the Isles through 10 rounds of an epic shootout after allowing Jeff Tambellini to score on the first attempt he faced. The frontrunner for the Calder so far is probably Tavares, simply because he probably had the inside track as the much-hyped first overall pick and he has done nothing to disappoint in the least so far. If he continues to produce like he has, he’ll cruise to the rookie of the year award. That said, should Tavares stumble van Riemsdyk and O’Reilly have played their way into consideration early. Gustavsson could factor in if he keeps standing on his head in Toronto, and as well as some of the defensemen have played, it’s really hard for a D-man to build the kind of backing to win the Calder as is needed.